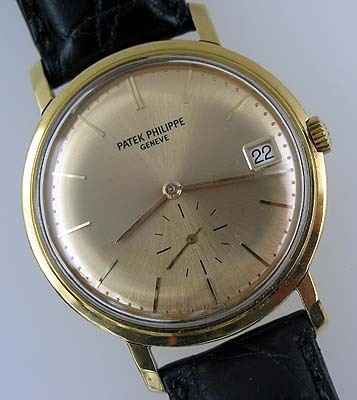 Large screw back automatic Patek Philippe, with date. This is a truly stunning watch from just about every point of view. Esthetically, it is an absolute classic with the large brand new ORIGINAL solid 18K gold dial with the date at the 3 o’clock marker and the sub seconds register in the lower section of the dial. 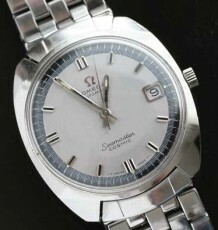 The watch carries the reference number 3445 and has the desirable waterproof screw on case back. Also the stepped lugs add a visual treat. The watch is fitted with the now legendary Patek Calibre 27-460M movement, that boasts a large and heavy solid gold rotor and 37 jewels. The effect of the gold rotor is that it provides more than enough inertia to keep the movement wound with only the slightest of physical activity. 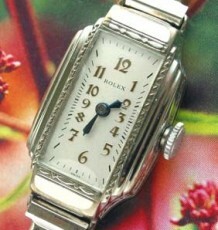 The watch was just serviced and keeps excellent time, it is supplied on a black Hadley Roma crocodile strap. 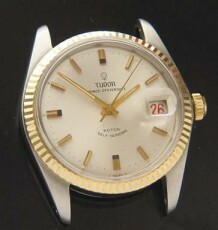 The watch measures 35mm wide (excluding crown)by 42mm long.